This is a lighter alternative to a big roast; it takes a short time to prepare – the syrup and purée are easily made – and is quick to cook. The list of ingredients looks long but that's just because the same ingredients crop up in each element – it won't seem as many once you get going. I blanch the coriander to take the bitter taste out, but you don't really need to: it's me being pedantic. Add a touch more sugar to balance it if you don't though. Preheat the oven to 170°C, gas mark 3. Fry the garlic in the sesame oil over a very low heat, add the soy sauces, sugar, vinegar and juice and zest of the lime. Bring the mixture to the boil and reduce for 8–10 minutes until it becomes syrupy. Cool and set aside. Put the avocado into a blender, with a little salt, sugar, lime juice and zest and sesame oil. Blend until smooth. Blanch the coriander, chop, and mix with the yogurt and sugar. Add salt to taste. On a baking sheet lined with parchment paper, lay the sea bass fillets skin-side up; drizzle with sesame oil and lime juice and scatter over the sesame seeds and zest. Season well and bake for 6–9 minutes. 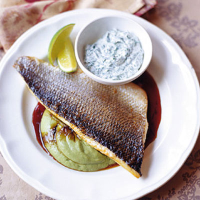 Place the fish on a plate, then arrange the sweet and sour syrup, the coriander yogurt and avocado purée around.